Three million savers in defined benefit pension schemes only have a 50/50 chance of receiving the payouts they were promised, a study has concluded. This would allow companies to pay a fee to transfer defined benefit schemes, such as final-salary pensions, to a larger fund - which would then have bigger investment opportunities. A standard deal for pension scheme members could see some receive better final payouts as a result, but others could see their expected income deteriorate. But pensions consultant John Ralfe described the superfund plan as "outrageous". He said there was "no crisis in defined benefit pensions, so there is no need for crisis measures" owing to a well-funded lifeboat system for collapsed schemes. "The PSLA is trying to undermine all the safeguards put in place for members since the 2004 Pensions Act. It wants to turn the clock back to the days when companies could walk away from their pensions without fully funding them," he said. 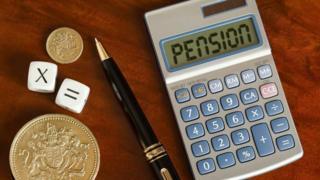 Can the UK afford the state pension? The in-depth study by the PLSA, the trade body for the industry, considered the outlook for defined benefit, including final-salary, pensions used by 11 million people in the UK. Defined benefit schemes promise savers a certain level of income when they retire, rather than relying on the success of investments. Employers have pumped in an extra £120bn in special payments to try to plug financial holes in these schemes, but the combined deficit of the UK's 6,000 schemes remains at £400bn. The majority of final-salary schemes had a sustainable model for meeting future payouts, the PLSA said. However, three million members of schemes faced a more uncertain financial future, it concluded. Ashok Gupta, who chaired the PLSA review, said there was a "real possibility" of a collapse for more high-profile pension schemes, and so the report's many proposals needed to be considered. "The industry and government need to grasp this opportunity and tackle serious flaws that threaten the security of people's retirement," he said. A spokesman for the Department for Work and Pensions said: "Most pension schemes are operating well and the vast majority of members can expect to receive their benefits in full. But in the wake of several high profile cases, there may be more that needs to be done to support the sector. "As we look at options such as the consolidation of pension schemes, we will continue to work with the industry, employers and scheme members to see what more can be done to increase confidence in defined benefit pensions." Pension saving has become automatic for most workers, owing to the government's automatic enrolment scheme, but there are still concerns about a lack of saving across all age groups. Insurer Aviva estimated that two million older workers had dependent children or parents, and a third expected to delay retirement with others likely to reduce pension saving owing to the financial pressures involved. "Many over-50s are shouldering the responsibility of putting their families' financial needs ahead of their own for a prolonged period of time," said Lindsey Rix, of Aviva. Aviva's survey did find that many older workers were staying on in employment owing to job satisfaction rather than financial need. Should we be worried about our pensions?